Spyker CEO Muller wants to take Saab back to its roots as the premium brand of choice for free-spirited car buyers who want to stand out from the crowd. AMSTERDAM -- Spyker CEO Victor Muller is ambitious, passionate, creative and he has an unstoppable drive to reach his goals. Losing is not a word in his vocabulary. These traits might be just what Saab needs to survive and flourish outside General Motors Co.'s ownership. Muller, 50, a Dutch businessman who relaunched Spyker as a small boutique sports car builder in 1999, has made a determined effort to buy Saab from a reluctant GM. He made a renewed bid for Saab on Dec. 20, two days after GM had rejected Spyker's first offer for its money-losing Swedish unit. GM is expected to announce on Jan. 7 whether it will sell Saab to Spyker or close the brand. Spyker is the only buyer under consideration for the Saab brand and is seeking to line up funding that will satisfy GM, a person with direct knowledge of the situation said Tuesday. Financing has been a main obstacle to a deal, said the person, who declined to be identified because the information isn't public. The proposal from Spyker had included a Russian partner that GM rejected, and Spyker was seeking to arrange financing that didn't include that partner. Muller's concept for Saab is not much different from that of Koenigsegg Group AB, a consortium led by Swedish supercar maker Koenigsegg whose bid for Saab collapsed in November. Like Koenigsegg, Muller wants to take Saab back to its roots as the premium brand of choice for free-spirited car buyers who want to stand out from the crowd. "We can add managing skills to help Saab rediscover independent brand development for an alternative premium product, something they used to do many years ago," Muller said in a phone interview. Spyker could also benefit from Saab's purchasing strength and its bigger dealer network. The Swedish brand's all-wheel-drive expertise would also help Spyker introduce an SUV as a second model line. "Spyker cannot live just from sports cars," Muller said. "With Saab we could use their all-wheel-drive expertise and other synergies such as their purchasing abilities and Saab's global dealer network." Muller sees similarities between the two carmakers despite the huge differences in size -- Spyker made 43 luxury cars last year compared with Saab's sales of 93,295. "Our brand values and character are closely related to that of Saab," he said. "Both Saab and Spyker are highly individualistic, both have an aircraft heritage and both follow independent Scandinavian and Dutch thinking." In reviving Spyker, which was founded in 19th century as a coachbuilder and later diversified into building cars and fighter planes, Muller has shown a fine touch for branding. He makes the most of Spyker's pioneering automotive heritage and constantly refers to the company's glorious past. He also revived a twin-bladed aircraft propeller as Spyker's proud logo. Back in 1898, Spyker built a golden coach for the Dutch royal family. In 1903, the company created the world's first car with a six-cylinder engine, which also had permanent all-wheel drive, a second world-first innovation. During World War I, Spyker produced military aircraft for the Dutch air force. After the war Spyker returned to making ultraluxury cars. In 1921 the company produced the fabulous C4, which it advertised as "for the rich only." But there weren't enough wealthy buyers and the company ran short of money. It struggled to survive until going out of business in 1925. A version of the Spyker C8 Laviolette was featured in the movie "Basic Instinct 2" in 2006. More than 70 years later, Muller, a proud Dutchman, dreamed of reviving Spyker as a world-class luxury sports car maker to stand as an icon of the automotive heritage and global trading tradition of his homeland. A lawyer by training, Muller worked for the Amsterdam office of law firm Baker & McKenzie after graduating in 1984. Later, he went into business and led several companies including Emergo Fashion Group, which became the McGregor Fashion Group after being launched on the Amsterdam Stock Exchange. Muller's business success helped him built up a collection of top-end classic cars. 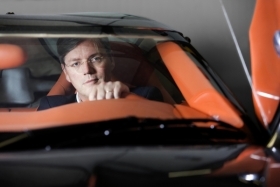 In 1999, he went further than just collecting cars and teamed up with car designer Maarten de Bruin to relaunch Spyker. De Bruin had built his own dream car, a two-seat coupe, which he called the Sylvestris, in the garage of his home in the small village of Gorsel, 100km east of Amsterdam. The Sylvestris forms the basis of today's Spyker cars, the C8 Laviolette Coupe and the C8 Aileron Coupe, which both have Audi V-8 engines. Spyker's public launch was in 2001 at the Birmingham auto show in England when Muller unveiled the Spyker C8 Spyder two-seat roadster, powered by a 405hp Audi V-8. The car turned up at prestigious shows and concours d'elegances around the world, including Pebble Beach, California. A variant of the car, the C8 Laviolette, was featured in the movie "Basic Instinct 2" in 2006. In May 2004, Spyker was floated on the Amsterdam Stock Exchange. It hasn't made a profit and an ill-timed adventure into Formula One racing brought Muller's company close to bankruptcy in 2007. "Our Formula One involvement was an absolute low point," Muller said, adding that winning fifth place against Porsche and Ferrari cars during the 2009 24-hour race in Le Mans was a highlight. Muller kept Spyker alive by refinancing Spyker with support from the Lithuanian bank Bankas Snoras, which is part of Russian tycoon Vladimir Antonov's Conversbank. But Spyker lost 8.7 million euros in the first six months of 2009 and its sales fell by 1.6 million euros to 4.1 million euros compared with the year before. Convincing GM and the European Investment Bank, which needs to approve a 400 million euros loan for Saab, that his plans for Saab are feasible might prove a much more difficult task for Muller than the achievement of reviving a piece of Dutch automotive heritage.